In a brief foray off our core topic of production lighting, On Stage Lighting presents a few QLab video tutorials for beginners. Looking at the popular show running software, we take you through the interface and working with audio cues before moving on to playing back video and other visual media. Looking for QLab Training? I run an online course of QLab, CLICK HERE to find out more. Regular readers of On Stage Lighting will know that I am currently teaching Technical Theatre subjects at a UK university, leading modules in Lighting, Sound and Video in Theatre Production. Although my specialism is obviously stage lighting design and programming, I have been known to break rank occasionally in my professional life and my current gig requires the teaching of many areas of technical production in performance including sound and AV. In order to streamline delivery of teaching I regularly use screencast video tutorials, particularly when it comes to learning software. The recent release of the On Stage Lighting Vectorworks tutorials for beginners proved to be very popular and valuable for many. As we believe in teaching current industry practice, our recorded sound and video playback system currently centres around the popular cueing software Qlab from Figure 53. Qlab is a regular feature on many professional performances around the world and is one of those pieces of software that seems quite “simple” in operation, yet manages to be extremely powerful. And, it’s basic and very usable free version is, well, FREE. Yes, it’s free and you can actually use it to playback your audio cues on a real show!! 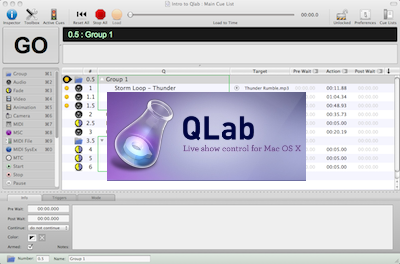 Running on the Apple Mac OSX platform, Qlab organises and fires audio and video content, can be used to build up soundscapes and automate the playback of recorded media. I wouldn’t claim to be an expert on the use of Qlab, my speciality as an educator is explaining things in simple terms and quite often people that are starting to learn a piece of software don’t need complex and technical tutorials, they just need to know the basics. With that in mind, On Stage Lighting has some Qlab video screencasts to get you started. ( You don’t have to watch the tutorials at the small embedded size, you can fullscreen them). The first tutorial covers a look some of the things that Qlab can do, it’s interface and how to find your way around it. What you need to know before you start. Note: There are a few specific references to our facilities at the University, you can ignore those. This longer video (split into two parts) takes a tour of the audio tools, organising and playing back cues, setting auto follow ons, adjusting levels and automating fades. Tools worked with include: Audio Cue, Group Cue, Fade Cue, Auto Follow, Auto Continue, Audio Levels, Audio Output, Settings tab, Loop. The final Qlab Basics tutorial videos deal with the use of movie files, replaying of video and images and the tools that Qlab has when dealing with visual media using the Video and Animation cues. I have a question. I’m a high school student, and my school is about to do the play Distraction. The script calls for there to be images projected onto the screen during transitions and things like that. All we really need projected are still images, and we don’t really have the budget to afford Qlab. I was wondering if you possibly had any suggestions for us. It is a limited version, but if you only need to project images it shouldn’t be a problem! Thank you so much! With this, would it be possible to run two separate projectors and also have something different projected on each screen at the same time? Hi what windows software do you recommend that does roughly the same as Qlabs? Stage Research has a program called SFX. It costs about the same, but you can only playback audio cues. It also doesn’t have many of the features that QLab has. I have worked with both programs, and SFX has a much larger learning curve, and just isn’t as user friendly (in my opinion). I’ll try it out later. So, I bought a Dual Matrox splitter and I have it hooked up to 2 projectors. A lab keeps reading the two projectors as one screen and the computer as a second screen. Is there any way for qlab to read the projectors as two different screens? I literally just closed a show in which I programmed Qlab to goto three TV’s through Matrox’s Triplehead2go. After playing around with Matrox’s software for a few days, we found that the only way that Qlab would pick up the TV screens was as one long screen, as described in the Qlab video tutorial above. It was relatively easy to program with only one screen on Qlab. It seems that the Mac OS itself does not pick up the Matrox as two different additional screens (In the Display options) so Qlab won’t either. Qlab is just reading what your Mac is giving it. Note that I am far from an expert on any of this technology, and I might be wrong. I only speak from recent experience. If that one screen is really bugging you, I’d suggest that you contact Matrox, Apple, or the guys at Figure53 for detailed answers. Matrox sends the image out as an extra wide image which stretches the image across two screens not splitting one image across two screens. You will need a splitter of some sort out of your display port to achieve the desired outcome. How do I trigger cues/ “go” cue vie MIDI without MIDI input, so via a timecode only? I have a .wav file that is 40 minutes. I want Q103 ( another image) to play at 10:05min in that music file and the image from Q102 to fade out. I ALSO want to only hit “GO” once and everything just run from there. If you aren’t using a timecode input, do you need to use a time code trigger? Or can you just not fire both the image and the .wav together (Auto follow/continue function set to black arrow with no circle in the list) and put an 8:05 Pre Wait time on the image? Similar deal with the second image and any animation cue that fades the first one. You can fire everything at once either with the Auto mentioned above OR by putting all the cues in a Group and and setting the Group to “Fire all children simultaneously”. The Pre Wait (or Post Wait, depending on what you want) is your friend. You can use timecode for the whole thing, running a timecode in Qlab and then sycning everything to it, but it’s not vital for what you seem to be trying to achieve. Any chance for a MIDI tutorial? If not, does someone know of a good one elsewhere? The MIDI or MIDI Show Control (MSC) implementation on Qlab is pretty straightforward when it comes to firing cues IF you have a MIDI input device and your Mac is receiving MIDI correctly. As long as you have the correct licence, using different MIDI values to trigger cues etc. is simply a matter of setting the Trigger to the MIDI Note or whatever. I’ve used it in a few different ways. This is all fine, assuming you understand what MIDI actually is/does AND understand the implementation of MIDI on your controlling device. The Qlab bit is the easy part, I’d say. I’ve got a kind of a strange problem using a canon HDV30 camera in Qlab. The cam is connected via DV/Firewire400 to the MacBook and i’ve chosen a PAL-Resolution of 720×576 in the camera-setup. This connection is fine so far – if I record the camera live feed with the quicktime player the picture looks fine and i get a video file with the original resolution of 720×576. If I create a camera que in QLab and choose the HDV30 QLab somehow doesn’t recognize the full resolution. The same happens with other cameras with PAL-Resolution. The resolution is nowhere shown in numbers but compared to the size of the screen I would suggest it’s only about 400×300. Therefore I’ve got to blow up the camera feed about 75% to get a full screen picture (Screen: Matorx Tripplehead – 3 Ouputs with 800×480). Is there any tricky configuration I have to do to get the full resolution? Is there any tricky configuration I have to do to use quartz composer rendering? thanks for the quick answer and thanks for the link. I’ll try my luck there. About the midi tutorials topic, i only have 1 question. Is there an easy way to hook up a pc-lighting program like chamsys magicq or any other like vector and grandma on pc without a hardware midi setup? Is there a tutorial to set it up? You can send MSC using a program called ipMIDI, which allows you to send MIDI signal over an Ethernet connection. I’ve found success sending MIDI between 2 Macs. I haven’t used it on PC, but I imagine it’s not hard to figure out. If you are going for ease, you might want to get a USB to MIDI cable or box.